Please try and stick to the I M alternation. It is a classical guitar technique that pretty much everyone will say needs to be adhered to. You won't have professionals, teachers, or more experienced players suggesting you use the raking technique rather than finger alternation. Best to establish good habits and technique from the beginning if you have a long term view of the classical guitar. Last edited by William Byrd on Sat Feb 09, 2019 12:23 am, edited 1 time in total. Thank you Christopher! I appreciate you taking the time to answer my questions, this is very helpful. Please try and stick to the I M alternation. It is a classical guitar technique that pretty much everyone will say needs to be adhered to. You won't have professionals, teachers, or more experienced players suggesting you use the raking technique rather than finger alternation however. Absolutely Bill! Thanks for the advice! Chris is right, but I wanted to chime in why. It is e because it is French, and is et in French, which is pronounced without the t.
Thanks, I love learning little things like this. Hello fellow D01 Delcampers! Here are my submissions for Lesson 1, any feedback or tips that you have would be greatly appreciated! Still struggling with Old Mac Donald, mostly on the D-D-G-G-G D-D-G-G-G bit, my fingers just don't want to move that fast yet (and I missed a damp there ). A couple of things to point out. Try resting your thumb on the 5th or 6th string when playing your rest strokes. It helps with stability of the right hand in the beginning stages. 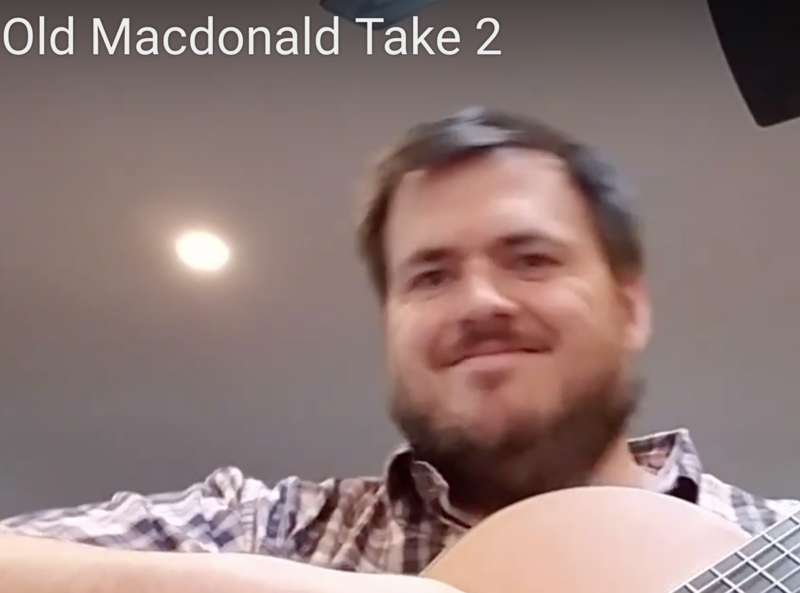 Also, I noticed that on Old MacDonald, you thumb was not behind the neck of the guitar but over the top. That wasn't the case with Au Claire however. Just be aware of your thumb placement going forward. Welcome Aaron. Nice first submission, good and even tempos. Watch your left thumb. In Old MacDonald its peeking out up over the neck. Look good in Au Claire though. Its seems impossible but that will come with time. Bill and Paul, thank you both so much for the feedback and encouragement, I'll try to keep that thumb in check. I know you guys are quite a bit further into the lessons, I really appreciate you coming back here and taking the time to watch my submissions and give advice. You're welcome and I'm only on lesson 4, LOL! You're so going to look back on these days as the easy ones. (But don't get discouraged, the pieces get more interesting also! Decided to give Old Mac Donald another go, could still stand to improve but overall much happier with this take. Thats awesome Aaron. Thumb is correct, no stumbles, well done and more importantly, great job sticking with it. Are you doing Lesson 2 now? I hope so. And this is the best part of the video. The smile at the end. Oh man, you made my day. That's just so wonderful. Bill and Paul, thank you both for the words of encouragement, you guys rock! I am definitely working on lesson 2 Paul, for about a week and a half now hoping I'll have some time to record this weekend (and glad I could make your day )! Greetings fellow students, I just joined yesterday and after reading on the forum it looks like the new session starts September and after this post(my second post) I will be able to download a few lessons that should hold me over until the next session. I peaked at the vids that were posted above by Aaron and look forward to learning some tunes in the first lesson!